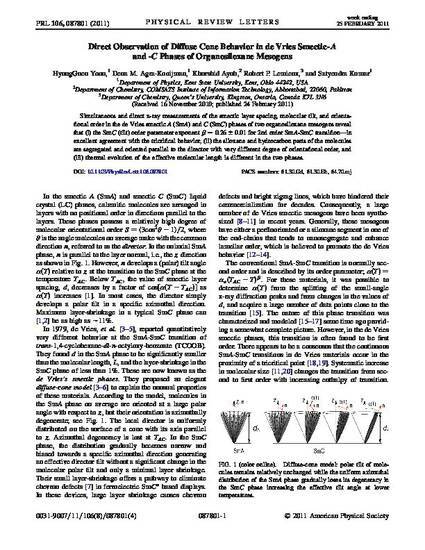 Simultaneous and direct x-ray measurements of the smectic layer spacing, molecular tilt, and orientational order in the de Vries smectic A (SmA) and C (SmC) phases of two organosiloxane mesogens reveal that (i) the SmC (tilt) order parameter exponent beta = 0.26 +/- 0.01 for 2nd order SmA-SmC transition-in excellent agreement with the tricritical behavior, (ii) the siloxane and hydrocarbon parts of the molecules are segregated and oriented parallel to the director with very different degree of orientational order, and (iii) thermal evolution of the effective molecular length is different in the two phases. Copyright 2011 American Physical Society. Available on publisher's site at http://dx.doi.org/10.1103/PhysRevLett.106.087801.